Coral jewellery possess a timeless appeal and are more than ever popular these days. The demand for coral jewellery has only grown with time despite the latest harvesting and trade regulations all over the world. Coral has been appreciated by the Chinese since ancient time, not only for its naturally unique shapes, but also for its rarity. Investing in coral is more or less an investment because fine coral jewellery is hard to come by. This customised organic gemstone jewellery, with jade and akoya pearl is nothing less than vintage. Customisation in jewellery designing permits us to let our imagination wander and reset any existing design with a cross design or with new coloured gems. This is the reason why many people these days are opting for customised designs because of the uniqueness factor associated with it. 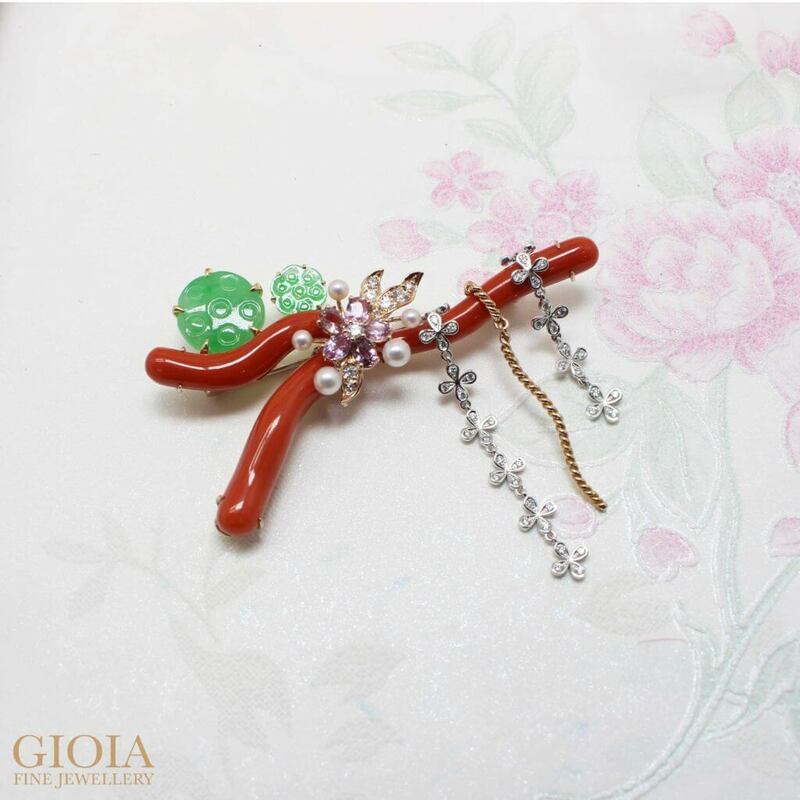 We have created this unique pendant which can also serve as a brooch. A touch of sparkle is imparted to this design with the use of faceted gemstones. It exudes an oriental feel with the use of akoya pearl and green jade. The gorgeous amalgamation of earthy colours renders the overall design extravagant. This customised piece can be worn as a brooch or can be detached to be worn as a pendant. This is a classic custom made jewellery, simply a restyle design by us at GIOIA from existing jewellery.